Since 1987, Tempest Technology Corporation has been a leader in the development of innovative ventilation tools for fire fighting and industrial work environments. In the beginning, Tempest produced inflator fans for hot air balloonists and now manufactures a wide variety of ventilation tools used by firefighters around the world to make their work environments safer. The technique of Positive Pressure Ventilation (PPV) has revolutionized the way hazardous interior environments are controlled and ventilated. Whether the structure is a 1,000 square foot home, 30-story building or mile-long tunnel, Positive Pressure Ventilation can be used to quickly replace a hostile interior environment with clean, fresh air. Tempest offers a comprehensive line of gasoline, electric and hydraulic powered blowers designed for a variety of emergency ventilation applications. Additionally, Tempest VentMaster Fire Rescue Saws and Raptor Carbide Chains are used by thousands of fire departments around the world for vertical ventilation operations. 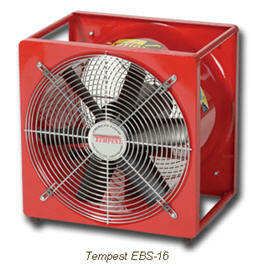 TEMPEST BLOWERS ARE AVAILABLE GASOLINE POWERED IN BOTH DIRECT DRIVE AND BELT DRIVE CONFIGURATIONS. TEMPEST GASOLINE BLOWERS PROVIDE HIGHER HORSEPOWER THEN ELECTRIC RESULTING IN HIGHER AIR VOLUMES AND PRESSURES AND FASTER VENTILATION. 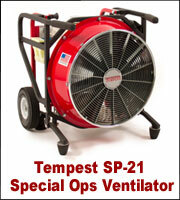 TEMPEST OFFERS THEIR POPULAR LINE OF ELECTRIC VENTILATORS IN SINGLE SPEED, VARIABLE SPEED AND HAZARDOUS LOCATION. 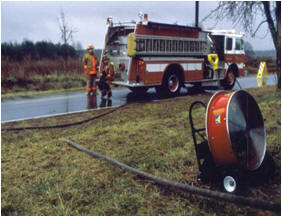 A Tempest Belt-Drive is the original PPV Power Blower and still the best for fire department applications. Offering the stability, durability and reliability that todays fire departments require, the Tempest Belt-Drive is the “Cadillac” of PPV blowers. Available in 18” to 27” diameter sizes, Tempest Belt-Drive blowers offer a superior combination of performance, durability and stability. • Belt-Drive systems help absorb engine vibration, preventing the blower from “walking” during operation on smooth surfaces. • The Belt-Drive pulleys are tuned to precisely match the horsepower and torque of the engine, maximizing performance. 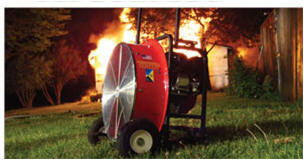 Tempest Direct-Drive blowers evolved from the “Controlled Airstreams” line of durable PPV blowers; the first direct-drive PPV’s and still the best. Available in 16” to 24” diameter sizes, there is a Tempest Direct-Drive to match your budget and compartment space. For the best combination of performance, compact size and light weight, choose a Tempest Direct-Drive. The impeller is mounted directly to the engine shaft, reducing the blowers overall weight. Vibration problems that are common to most direct-drive blowers have been minimize with the use of overhead valve engines, precisely balanced impellers, and vibration-absorbing feet. The direct-drive design is more compact to provide a smaller profile for storage in most apparatus compartments. Tempest Power Blowers Feature Flip-Up / Fold-Down Handles, Off- Road Tires, Foot Operated PPV Tilt Adjustment and AirFlex Impellers to simplify operator handling and improve performance. 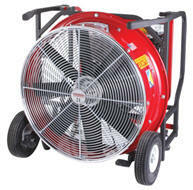 The VSX blower produces the highest rated CFM of any Variable Speed Electric Blower. 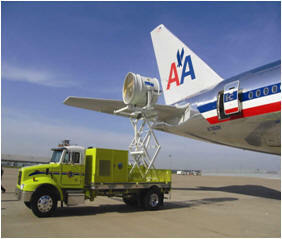 Third-party certified Airflow, the CFM levels of the VSX are comparable to many gasoline powered blowers. The Multi-Fan “VSG” Motor offers GFCI Compatibility and the most powerful electric blower, size-for-size, in the market today! Speeds of up to 3,200rpm are controlled with the convenience and ease of a rheostat speed control. with the convenience and ease of a rheostat speed control. Single-speed Power Blowers feature TEFC motors that can be ordered in 120V/60 Hz or 230V/50Hz. Hazardous location motors are intended for Class 1, Group C&D and Class 2 Group F&G Environments. 18.75" x 14.25" x 19.50"
18.50" x 20.00" x 20.50"
22.25" x 21.00" x 24.00"
25.00" x 21.00" x 26.00"
28.25" x 22.50" x 30.00"
Tempest Technology Corporation has introduced a catalytic converter for Honda-powered positive pressure ventilation (PPV) blowers. Tempest has teamed up with Global Emission Systems, Inc (GESi) to develop this emissions control device. PPV blowers with GESi technology generate the lowest levels of carbon monoxide, hydrocarbons and nitrogen oxides. The GESi reduces PPV carbon monoxide emissions by up to 80 per cent. Backed by a two-year warranty on new engines and a one-year warranty on used engines, the device is available for Honda GX160, GX200 and GX270 engines. 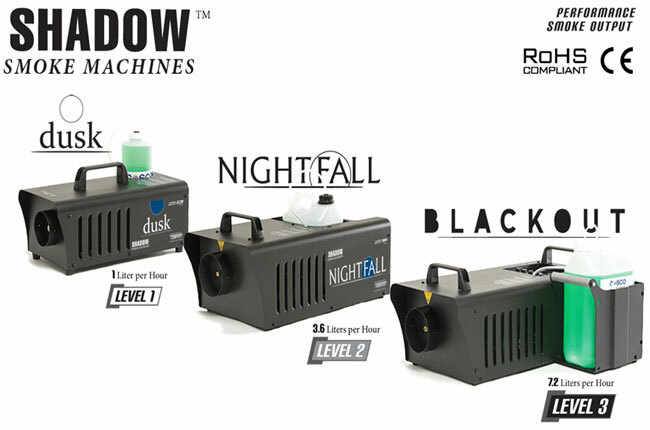 Meet the New SHADOW™ Smoke Machines Our entire line of Shadow™ Smoke Machines has been improved inside and out, and now offers the perfect solution for any and all levels of need. Every Shadow™ is backed by the tried and true Tempest name. We pride ourselves on our level of service and support, something you'll receive with the purchase of any of these high performance smoke machines. Shadow™ Dusk: Entry level unit designed for simplicity and performance smoke output; all at a very competitive price. Shadow™ Nightfall: The perfect balance in high performance, features and cost. Shadow™ Blackout: Built for extreme smoke output; eight times the smoke as the Dusk and twice as much as the Nightfall. Built in Cleaning (Tempest Exclusive Feature): Say goodbye to clogged and burnt out costly heat exchangers. In addition to an integrated remote control with 3-’ of cable the Nightfall and Blackout smoke machines also both offer a built in air-cleaning system, allowing for rapid cleaning via bottled air after each use. NOTE: Purchase of the Air Cleaning Kit is needed to attach an air supply to the smoke machine's built in air-cleaning system. The VentMaster line of chain saws feature the New Husqvarna Pro 576HD Power Head, the most advanced power head available for fire service operation. service operation. With higher peak power and 20% more torque, the 576HD provides maximum cutting power over a longer range while improving productivity. The new One Step Starting, which combines the choke, throttle lock and stop mechanism all in one switch, eliminates flooding and allows fast convenient starting. The Raptor Carbide tipped chain was engineered to withstand the rigors of fire service operation. The Raptor cuts quicker and lasts longer than bullet chain or single raker carbide chain. Tempest has combined the 576 HD and the Raptor Carbide Chain to provide you with a winning combination: faster cuts, higher peak power, less maintenance and improved user productivity. The 375K Cutoff Saw incorporates features found on no other Cut Off Saw on the market today. This lightweight unit provides for maximum Power, Versatility and durability. The 396K Cutoff Saw is the newest addition to the Ventmaster line of durable cutting tools for the fire service. Incorporating features found on no other fire/rescue cutoff saw, the Ventmaster 396K meets the needs of today’s fire service personel. Stability Like no Other Saw: The 396K features a 1.5” diameter by 7” wide saw support roller attached underneath the engine head to provide for more stable operation and to support the weight of the saw during long trench cuts. Also provides leverage during plunge cuts. Fast, Easy Starting: A compression release button reduces the amount of force required to get the saw started. A D-Ring Starter Handle makes the saw easy to crank while wearing heavy gloves. Versatility for Tough Cutting Jobs: A 180-degree reversible cutting arm allows cutting within one inch of walls, curbs, or vertical obstructions. Ideal for tight confined space situations that require awkward cutting angles. The 3120K Cutoff Saw - This 119cc saw is one of the most powerful handheld power cutters. The 3120K has a rugged and powerful engine that can handle deep cutting applications with blade diameters up to 16". Air Injection: Centrifugal air cleaning system for longer intervals between filter cleanings, smoother operation and reduced wear.